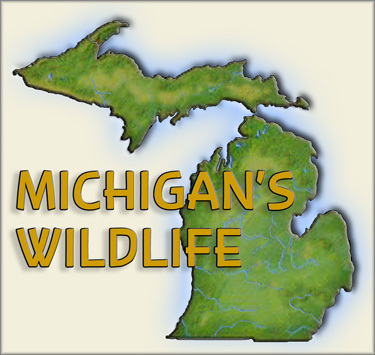 Volunteers are what make Michigan’s Natural world healthy and alive. We have the very best of people here in Michigan, who selflessly give of their time and money to help our beautiful state remain that way. After some 15 years with Hiking Michigan and Hiking North/Central Michigan, I have met many people who have a special relationship with Mother Nature. It is not just their passion or Love for the Natural World, but it is also what MOM gives back to them in special ways. MOM gives special things to Mark regularly. Yes……we all have those moments where we catch that critter doing something interesting, or that Bird swooping down for some food, or run across that patch of rare Flowers you seldom get a chance to see. When you take a look at Mark’s Photo albums of his outdoor experiences, you will see just what I mean. On a regular basis he captures unique and extra special outdoor activities that we all hope to run across ourselves. Mark is of course, an experienced Outdoorsman and understands different techniques in Tracking and waiting on critters in the wild. He also has a special inquisitive nature that leads him to places where those special flowers grow. But it is much more then that. It happens to regularly for it to be just Mark’s experience. MOM is giving him special things too. I believe it is because of what he gives the Natural world in his work and help. OK……this may sound a bit wild. 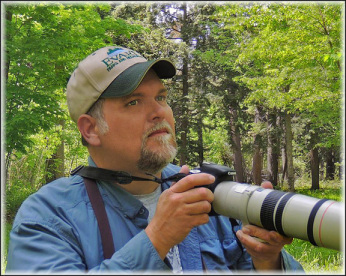 But take a look at some of his Outdoor Photo albums and see if anyone you know has that kind of regular luck in finding critters, Birds and special environments as mark does. There are many other people I know or have met through my years out in the Outdoors. These are just a couple of MOM’s favorites, I thought I would mention here. I could not possibly list everyones name here. But you know who you are. And so does MOM. If you are an Outdoors person of any sort, then having an Outdoors Car Kit is something you either have already or are contemplating. Every person who heads out to our Michigan Forests and Parks, in any season, should have a Car Kit of needed outdoor items. To many times we jump into the car, with not alot of time, and rush on over to our favorite Hiking place. We get there and then realize we have forgotten something. It may not be a huge item we have forgotten, but it can be the difference between a quick fun Hike, Bird watching ventures or Mushroom hunt, and a bad time. You forgot Insect repellent. Not a good thing. You did not bring any water with you. Not deadly, but the difference between an enjoyable time and one focused on thirst. All these little things can make a big difference in our Outdoor experiences. Packing a set of items for every season, and keeping them in the Car at all times, eliminates so many small problems that can turn into big ones. 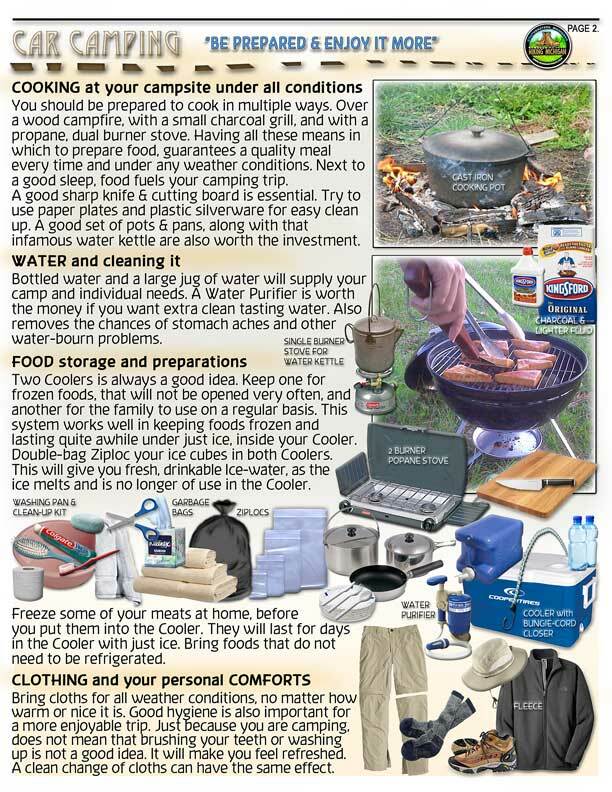 These essentials for almost any Outdoors venture, should be stored in the car, in a waterproof container. Keeping moisture and severe temperature changes, away from your Car Outdoor KIT, will allow these items to last indefinitely for you. You may not even use them over a year period. BUT……they are always there for those times you have forgotten something. Or your Outdoors partner has forgotten something. When your Hiking buddy is having a bad time….YOU most likely will be experiencing some of that pain as well. 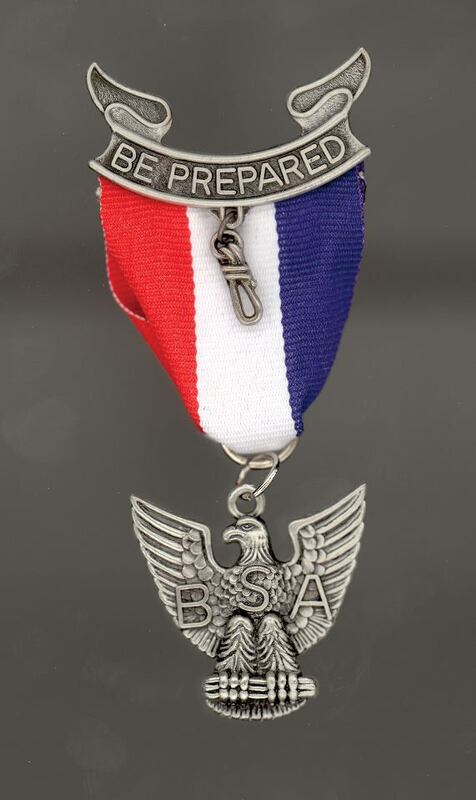 So being prepared is a good thing, all the way around. Take a look at the List we have created here. They are the essentials. BUT…..there are of course, your personal needs of things that YOU require to have the best, safe and funnest time in the Outdoors. I cannot tell you how important something so simple like this stashed Car Outdoors KIT can be. That very first time you use something from your hidden Car KIT, will pay for the time it took for you to put it together. I do not think that any will disagree with the fact that on many trips out to the Parks, we forget something. And it usually is that item that has the most effect on our relaxing and enjoyment of the Outdoors. You can download the CAR OUTDOORS KIT here. 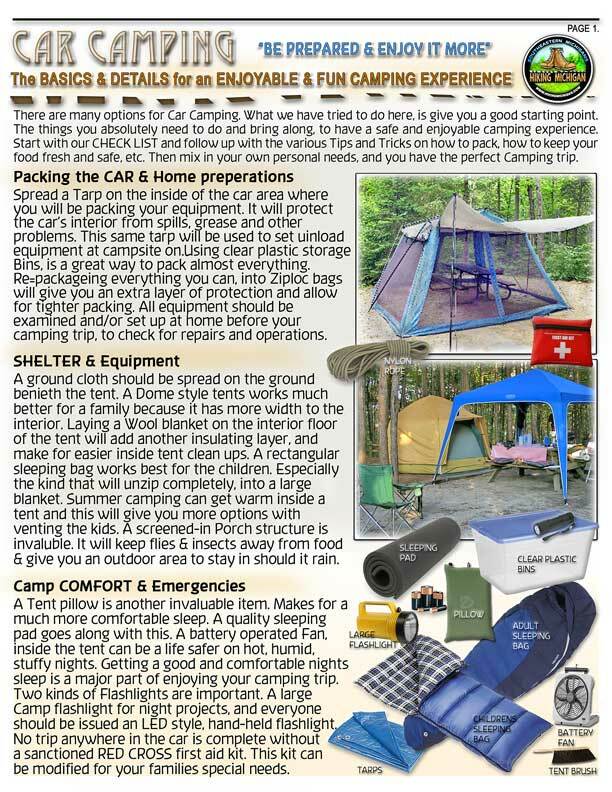 You may also be interested in a set of sheets we put together last year on CAR CAMPING NEEDS. It is similar in the same way as the CAR OUTDOORS KIT has all those things you need to not get caught without something. The CAR CAMPING sheets do the same thing. We list out the basic needs for a CAR Camping weekend and those things that are a must for a quality time camping from your Car. 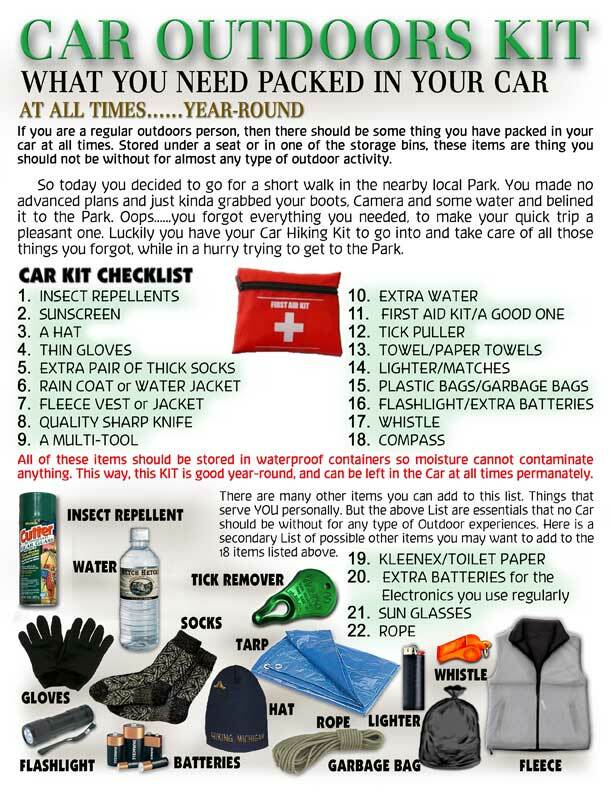 You will notice that some of the items for the Car Camping lists are the same as what is on the Car Outdoors KIT. It is OK to have two of anything while Camping. So do not be concerned about repeats. With the big resurgence in Camping here in Michigan, many people are getting out to the Parks and doing just that. Camping also makes for a less expensive and more enjoyable Vacation as well. When was the last time you headed up north, set up Camp and enjoyed the beautiful places that are just everywhere in Michigan? Camping does not have to always be a small Tent in the middle of nowhere. Many people do what I call….CAR CAMPING. pack that car up in the right way, get a larger Tent that is roomy and very comfortable, and even set it up at a Campground that may have all the amenities you would like to see. Hot water showers, Flush toilets, Running water and all those little things that will make your Car Camping experience something very rewarding. Rather then a local Motel, setting up that tent, near the shoreline of a beautiful Lake or Pond, and establishing your base Camp, will allow you to explore right from your Camp site. Walk 100 yards and Fish. Hike right from your Camp site. A Campfire anytime you want one. Just a few of the benefits you get from Camping. Mark and I put together a few sheets of what we thought where the basics to packing up the car and getting a Camp site at the right Campground for the weekend. You will of course add to the lists we have created here. 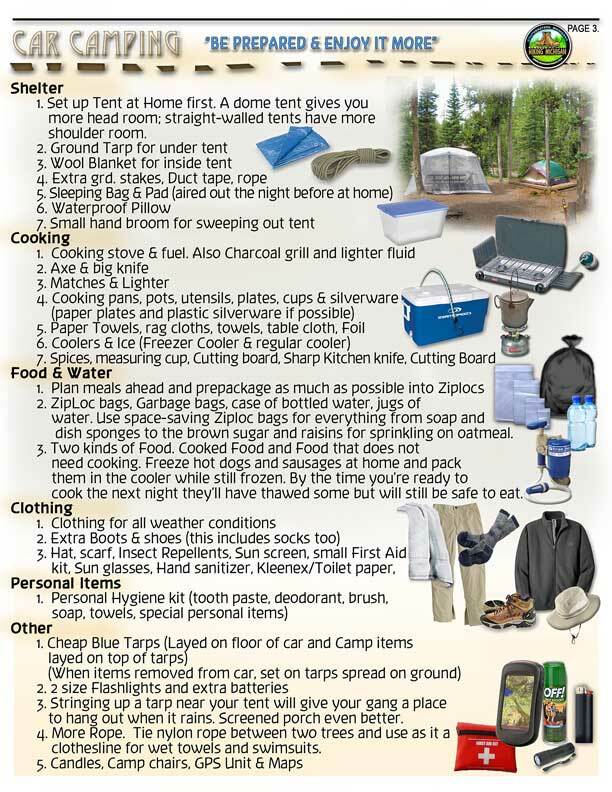 But we think we have covered the basic needs of almost anyone who wanted to do a Car Camping weekend. Car Camping is a GREAT way to see Michigan. It is much less expensive then Motels, and it gets you right there, into the beautiful spots you went to see to begin with. 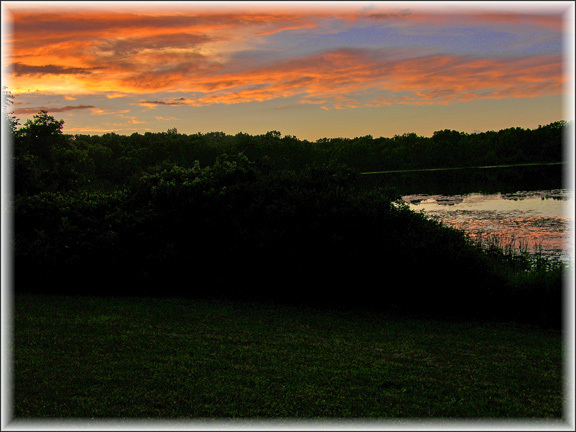 No need to leave the Motel or Bed & Breakfast to head out to that Lake or Trails. It is right there just off your Camp site. Done correctly, you will not even have to drive to many of the things you came to experience. You can get to them right from your Camp site. You can download the CAR CAMPING info sheets here. Get out and see our beautiful state of Michigan. Do it in a very personal and up close way, by Car Camping. You will not regret it. There are so many different kinds of Campground around our state. Some have every amenity you could ever need, and others are more Rustic. Choose what best fits you and or your Family, and GO GET OUTDOORS in Michigan. I just read an article called silent sports. It had some interesting points and observations, but also went to places I just did not understand. It is getting to the point that I need an interpreter to read some of these articles, reports and studies about Nature and the outdoors. Is it a bad thing now, to just enjoy the outdoors. The Nature aspects of being in the Forest, exploring the shoreline of a remote lake or pond, Fishing, sitting quietly on the edge of a Meadow with binoculars and waiting to see what I can spot emerging into that Meadow? Why is everything now a Sport? Challenging……something to be conquered. What happened to just the enjoyment of a special ecosystem or quite place? A place that the only sounds are those of the natural world around you. That stream flowing over the rocks, the wind whipping through the Pine Trees, the Birds singing and fluttering overhead. These are calming things. Things that allow us to turn off from the hectic world and get us connected again, to the Natural world. We need these things as humans. Everything cannot be a challenge, Adventure, Conquering moment or Adrenaline filled experience. What about learning something while we listen to the silence? Maybe all the direct connections we now have with our cell phones, Tablets and communication devices will no longer allow these quite times. but all it takes is the OFF switch. Turn OFF these devices. Turn OFF that fake need for constant excitement and movement. Be silent with the outdoors. Experience it without hurting, conquering or flying by it. STOP…….SIT or SLOW DOWN…..and see just what you have been missing. Really look around you. 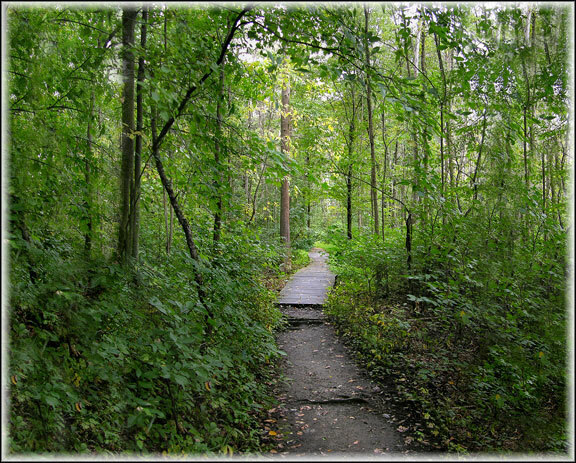 See ALL the wonders that make up Michigan’s Forests, Shorelines, Lakes Streams and Natural World. There is plenty of time for all the gadgets and fast paced stuff. Everything does not have to be done quickly or with an intensity that makes it no longer enjoyable, but rather a task that needs to be accomplished in some way. How about accomplishing nothing other then a quiet moment with the critters and natural life in the many beautiful places in Michigan. You do not need any other inanimate objects. You do not need to have any skills at any so called particular Sport. All you need is the effort at walking or Hiking to that special place and relaxing by blending into it all. Pretty simple, easy and actually rewarding. I have lived my entire life in Michigan. I am third generation Michigander and very proud of that fact. I have always felt very connected to my state. Mostly through the outdoors. The Lands, Waterways, Parks, Rivers and Lakes. Since a child, these are the things I have always thought of when I thought of my state. But recently. OH…..maybe the last 5-6 years now, I have seen a huge change in how the people in power in Michigan view my state. They think all of the things that have defined Michigan, are for sale in some way. They do not seem to understand the delicate interconnections there are between the Land and Waterways…..between the wildlife and the Trees. They just seem to think that you can sell all the Trees and it does not affect anything else. Or you can drain the fresh waters and it does not affect anything else. I do not understand this thinking. And apparently these interconnections are not understood by our Representatives. I write this Blog on our North/Central groups site, because I feel that the people living outside of the more populated Southeastern Michigan regions understand this at a deeper level. Now do not be insulted S.E.Michigan people. Many of you know exactly what I am saying here too. I just have seen that most people outside of S.E.Michigan actually live the connections I have mentioned above. These are not Political things I speak of here. Although some of the issues and reasons why they are happening may have political connections somewhere, that is not their primary beginnings. Money seems to be the starting points on much of these things. But how can anyone think that we can sell our beauty, our Fresh Waters and abundant wildlife in Michigan and not pay a very dear price at some point in time? I know this may sound naive, but I just do not understand these things. For me, Michigan is my Home, and I could never divide up pieces of my Home and sell them or abandon them for anything. money, Career, or anything. Like the BILL SB 78 that is running through Lansing at this moment. If this Legislation passes through Lansing it will remove Biodiversity and it’s protection in Michigan. Without Biodiversity, we will be left with Zebra Muscles and Asian Carp in our Lakes, and a slew of about dozen Invasive Species being the dominant plants through out our state’s lands. Then what? There is almost no returning from that. Yet these Senators and their backers push these things through Lansing, for money today, and Nothing tomorrow. They want to sell my Home. Our Home. I thought we had hired professionals and pay them to watch over at least our communal State Lands & Waterways through OUR Department of Natural Resources. Yet OUR state agency has not only failed us but in many case they are in connections with these senators and criminal businesses and Non Profit groups who want to sell pieces of our Home with no regard to what will happen to what is left after they get done with their little piece of controlling things for THEIR little groups. 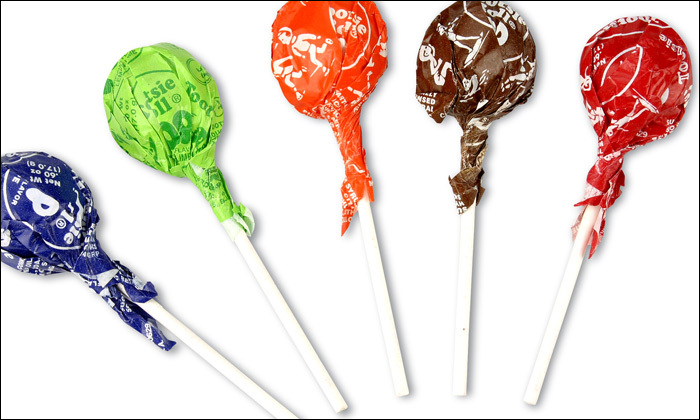 The majority of us true Michiganders are left with their scraps. Trying to fix what they have destroyed in the name of THEIR little Non Profit group or Company. Again….while the people from our DNR just sit and watch or help them do these things. I can hardly believe some of the things I have witnessed over the last two years or so. I would never have believed these kinds of things could ever happen in Michigan or by our DNR if you asked me 10 years ago. But here they are. A DNR who’s main focus is controlling our Outdoor recreational experiences. Are you Kidding me? I can select what I want to do on my Lands & waterways, and we all expect YOU, our DNR to do the jobs you where hired to do. Watch over the health and well being of our states Natural resources. Get your faces out of our Outdoor Recreational experiences and selections. And forget about sponsoring state Ice creams too. Stupid. All I can say anymore is……..Help save our Home here in Michigan. Stop our own DNR from destroying it all. Stop these Non Profit groups in connection with our DNR from destroying whatever they want to, just to get a new BIKE Pathway or Recreational activity that is the rage at this time. Ask our DNR why Invasive Species rule our Lands & Waterways while they spend our PASSPORT money on Programs like, “CONQUERING RECREATION 101”, or millions of our dollars given to groups and communities to further build more BIKE Pathways around our state while neglecting Biodiversity and the protection of our Forests and Lakes. Sometimes one must stand up and protect their Home from intruders. That time has come for us true Michiganders, before it is all taken away, sold down the road or crippled to the point of not repairable. We now must watch things much closer. Do not believe what you hear from these people. The DNR, Non Profit Groups connected at the hip with our DNR, or any of these so called “STAKEHOLDERS” the DNR likes to refer to the people that back THEIR plans in OUR HOME state. Investigate what they are telling us, because most of the time, it is not the truth. Do not let our Home go away on simple lies from simple minded thieves. Their goals are that of money…..Careers….Power and Control. They do not care about our HOME…..MICHIGAN! With such an increase in Birding interest here in Michigan, we decided we needed to get some ID help going. 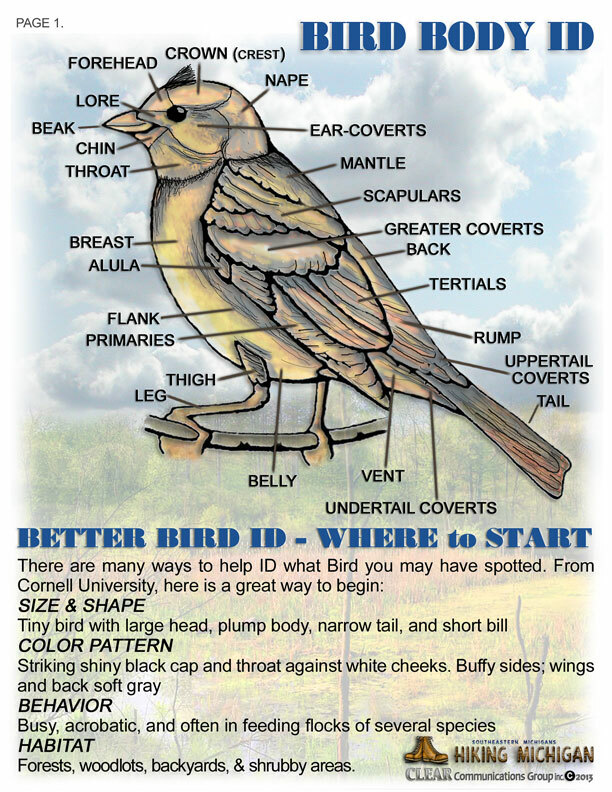 We asked our members and many expert Birders in Southeastern Michigan for their ideas and help in putting something together that would assist the beginner in identifying different Birds while out on the Trails. The two sheet we put together should help in telling one Bird from another. 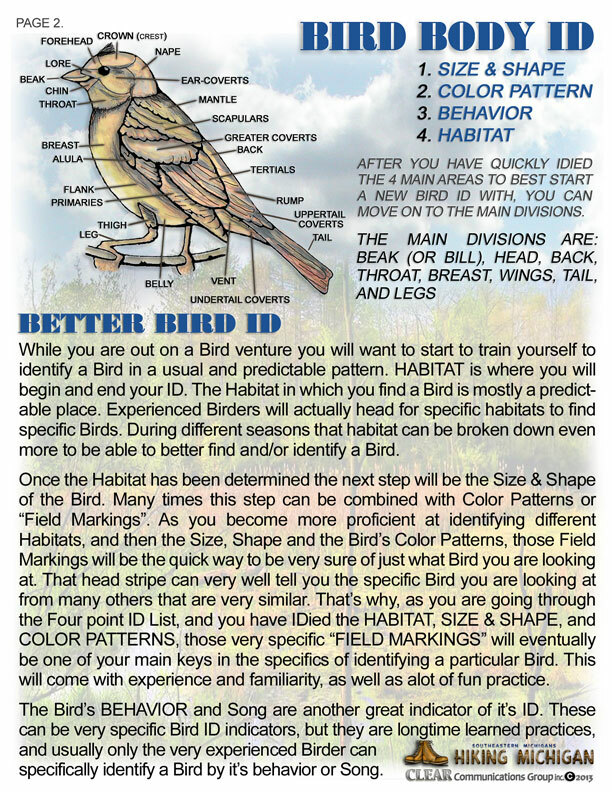 Practice is always the best way to get more proficient at IDing different Birds. But these ID sheets should help everyone in getting that quick ID going, rather then just standing there and saying…..”What a Cool Bird that was”. Birding has taken some huge strides the last couple of years, with all the web sites and APPS for our cell phones and Tablets. These make Identifying Birds out in the field, much easier. But there still needs to be a pattern to what you are looking for and in what order, that will best and most quickly help you ID that Bird. Being a lifetime Michigan resident, and generations of my family living working and raising their families here, I have had very deep roots and pride in our state. That pride has never been connected to the Auto industry though. I was taught early on, that these where the man-made things in Michigan, and that our state had so much more to be proud of and connected too. So even as a small child I was connected to the Lands and Waterways that IS Michigan. All of our Lakes, Streams, Rivers, vast land tracts, wildlife and many diverse ecosystems where like no other place in the world. Growing up in the largest fresh water ecosystem in the world provides us Michiganders with so many wonders that for some they are just usable “THINGS”, and there is no direct connection to our natural worlds here. This is not what my parents and grandparents taught me. From a very early age we where shown that what defined our beautiful state with all the unique diversity, was just how it all interconnected with one another. How we needed healthy Trees to provide food and cover for critters, and how those critters living under the Trees provided ecosystems that the birds and insects thrived on. It all is just so deeply connected. Yet……there are now people in charge of these things who do not understand this. They think these delicately balanced environments, that depend on so many different life forms interconnecting with one another, is what truly makes a healthy Natural environment. NO….they almost believe themselves to be God. THEY can create these environments. THEY can control how it all works. THEY see no reason to nurture these delicate systems and help them by eradicating Invasive Species and the destructive people who belive that our Natural Resources in Michigan are just there for their personal Recreational FUN. What is the worst of all, is that the one main state agency that is assigned to protecting and assisting these many diverse ecosystems and delicate interconnects are no focused on using them for money. That is their focus. Not the health of these environments, but how can they be used for economical gains. These are suppose to be educated people in charge of our DNR, yet they do not understand the very simple fact that a Healthy Natural Resources based ecosystems, will provide our Recreation for EVERYONE in our state. Not a hard concept to understand, unless “CONTROL” is your focus. But they are nothing but an embarrassment to the entire state. Led by Ron Olsen the head of Parks & Recreation, the DNRs main focus is on amusement rides, Thrilling outdoor adventures, Eco-tourism and their inane beliefs that they have the ability to control, rebuild what they destroy and even build new entire environments. What audacity!!!!!!!!! Their actions are not just an embarrassment to all the people of Michigan, but their incompetence borders on criminal. I cry for my state of Michigan. Especially for what has taken place these last two years under the guise of the people supporting a Healthy Natural Resources, and then being duped by the DNR into much of our support PASSPORT money and focus, going into Adventure Sports, Thrill Recreation and endless useless Linear Bike Pathways. Mr. Olsen,,,,,You should be ashamed of yourself. We are ashamed of you. Just because you surround yourself with yes men who fear you and worry about their jobs if they do not go along with this insane programs, does not mean you are doing anything of honor for our state. My guess is……You are not even a true Michigander. How could you be and do what you have been doing?